For the eponymous film, see The Society of the Spectacle (film). 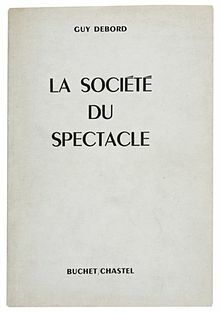 The Society of the Spectacle (French: La société du spectacle) is a 1967 work of philosophy and Marxist critical theory by Guy Debord, in which the author develops and presents the concept of the Spectacle. The book is considered a seminal text for the Situationist movement. Debord published a follow-up book Comments on the Society of the Spectacle in 1988. The work is a series of 221 short theses in the form of aphorisms. Each thesis contains one paragraph. The spectacle is the inverted image of society in which relations between commodities have supplanted relations between people, in which "passive identification with the spectacle supplants genuine activity". "The spectacle is not a collection of images," Debord writes, "rather, it is a social relation among people, mediated by images." In his analysis of the spectacular society, Debord notes that the quality of life is impoverished, with such a lack of authenticity that human perceptions are affected, and an attendant degradation of knowledge, which in turn hinders critical thought. Debord analyzes the use of knowledge to assuage reality: the spectacle obfuscates the past, imploding it with the future into an undifferentiated mass, a type of never-ending present; in this way the spectacle prevents individuals from realizing that the society of spectacle is only a moment in history, one that can be overturned through revolution. Debord's aim and proposal is "to wake up the spectator who has been drugged by spectacular images...through radical action in the form of the construction of situations...situations that bring a revolutionary reordering of life, politics, and art". In the Situationist view, situations are actively created moments characterized by "a sense of self-consciousness of existence within a particular environment or ambience". The Society of the Spectacle is a critique of contemporary consumer culture and commodity fetishism, dealing with issues such as class alienation, cultural homogenization, and mass media. When Debord says that "All that was once directly lived has become mere representation," he is referring to the central importance of the image in contemporary society. Images, Debord says, have supplanted genuine human interaction. Thus, Debord's fourth thesis is: "The spectacle is not a collection of images; rather, it is a social relationship between people that is mediated by images." Debord contends further that "the remains of religion and of the family (the principal relic of the heritage of class power) and the moral repression they assure, merge whenever the enjoyment of this world is affirmed–this world being nothing other than repressive pseudo-enjoyment." "The monotheistic religions were a compromise between myth and history, ... These religions arose on the soil of history, and established themselves there. But there they still preserve themselves in radical opposition to history." Debord defines them as Semi-historical religion. "The growth of knowledge about society, which includes the understanding of history as the heart of culture, derives from itself an irreversible knowledge, which is expressed by the destruction of God." In Chapter 8, "Negation and Consumption Within Culture", Debord includes a critical analysis of the works of three American sociologists. Debord discusses at length Daniel J. Boorstin's The Image (1961), arguing that Boorstin missed the concept of Spectacle. In thesis 192, Debord mentions some American sociologists who have described the general project of developed capitalism which "aims to recapture the fragmented worker as a personality well integrated in the group;" the examples mentioned by Debord are David Riesman, author of The Lonely Crowd (1950), and William H. Whyte, author of the 1956 bestseller The Organization Man. Among the 1950s sociologists who are usually compared to Riesman and Whyte, is C. Wright Mills, author of White Collar: The American Middle Classes. Riesman's "Lonely Crowd" term is also used in thesis 28. "Ideas improve. The meaning of words participates in the improvement. Plagiarism is necessary. Progress implies it. It embraces an author's phrase, makes use of his expressions, erases a false idea, and replaces it with the right idea." This passage concerning plagiarism is itself directly lifted from Poésies, a minor work of literary criticism by French-Uruguayan author Isidore Lucien Ducasse, better known as the Comte de Lautréamont. In particular, the original French text for both Debord and Lautréamont's versions of the passage are identical: "Les idées s'améliorent. Le sens des mots y participe. Le plagiat est nécessaire. Le progrès l'implique. Il serre de près la phrase d'un auteur, se sert de ses expressions, efface une idée fausse, la remplace par l'idée juste." Translation by Fredy Perlman and friends (Black & Red, 1970; rev. ed. 1977). Translation by Ken Knabb (Rebel Press, 2004; annotated ed. : Bureau of Public Secrets, 2014). Life magazine used one of the photographs as the cover of a brochure about the 1946-1955 decade. The photograph employed in the Black and Red edition shows the audience in "a virtually trance-like state of absorption, their faces grim, their lips pursed;" however, in the one chosen by Life, "the spectators are laughing, their expressions of hilarity conveying the pleasure of an uproarious, active spectatorship." The Black and Red version also is flipped left to right, and cropped. Despite widespread association among English-speaking readers, Debord had nothing to do with this cover illustration, which was chosen by Black and Red. ^ Debord (1988) Comments on the Society of the Spectacle. ^ Debord (1994) thesis 42. ^ Debord (1994) thesis 4. ^ Debord (1977) from thesis 25: "All community and all critical sense are dissolved"
^ from Debord (1977) thesis 132: "The masters who make history their private property, under the protection of myth, possess first of all a private ownership of the mode of illusionn: in China and Egypt they long held a monopoly over the immortality of the soul ... The growth of their real historical power goes together with a popularization of the possession of myth and illusion." ^ Debord, Guy. "La Société du spectacle (Chapitre 8)". Bibliowiki. ^ Ducasse, Isidore (2005-11-03). Poésies. Gutenberg.